TAC SHIELD Tactical Gun Belt is the latest in modern gun carry. Available in both 1.5" and 1.75" widths. The heavy-duty 2,000 lb. aluminum buckles have double release levers to provide extra security, but ease of opening for the wearer. The low-profile design includes tapered edges for snag-free comfort. The buckle locks the webbing to prevent slippage with even the heaviest loads. Double-wall webbing is reinforced with a Special Poly Stiffener System. This design provides extra support in the holster/mag case region, while offering softer edging in the spinal area for additional comfort and protection. 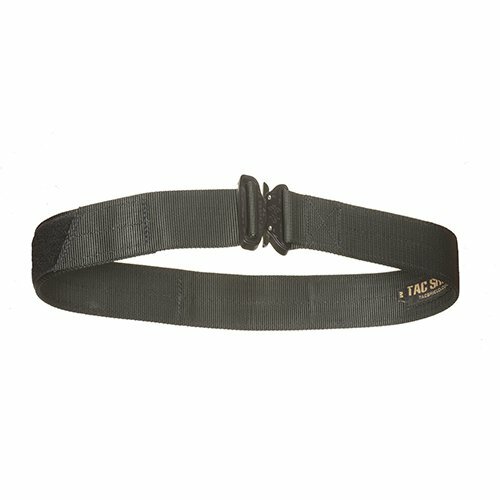 Belts are adjustable up to four inches with the hook & loop tail lock design. It can be worn in traditional pant loops or larger tactical pant loops. If sized correctly, it will fit over your pants for convenience in removing holster/mag case as a unit. If you have any questions about this product by Tac Shield, contact us by completing and submitting the form below. If you are looking for a specif part number, please include it with your message.